I am sometimes asked why science-based couples therapy is so essential. Perhaps as an answer to that question, we can take a brief look at the “bad old days.” Before couple retreats. Before any sort of scientific metrics. This was the dawn of couples therapy in the 1950’s. It was a time of monolithic patriarchy, male privilege, and crackpot pseudo-science. No wonder couples therapy before the arrival of Dr. John Gottman and his meticulous research was notoriously ineffective. America in the 1950’s craved couples therapy. Divorce rates in the U.S. were rising by the end of World War II. The burgeoning middle class was becoming increasingly preoccupied with the quality of marriage and family life. Increasing incidents of divorce and simmering discontents, which would later erupt into the second wave of feminism compelled many couples to seek professional “help” to improve their marriages. The notion at the time was that a troubled marriage could be salvaged, and divorce prevented, but only if the wife took massive action. The leading “expert” in marriage counseling at the time was Paul Popenoe. Wiki calls him the father of marriage counseling in the United States. Paul Popenoe had absolutely no background in either mental health or psychology. His only formal training was as a horticulturist. He knew far more about dates….than date night. Like Hitler, he had a fascination with eugenics, and he was a leader in promoting the sterilization of the mentally ill. Popenoe was also an enthusiastic racist. Popenoe believed that all inferior “waste people” people should be housed on rural farms, and worked as slaves to pay for their upkeep. Popenoe’s fame grew along with America’s interest in marriage counseling. In the 1950’s Popenoe was everywhere. He appeared for over a decade on Art Linkletter’s TV show, and other early television programs, pandering his racist, moralistic pseudo-science. Unfortunately, he successfully established one of America’s first marriage counseling centers, The American Institute of Family Relations. The institute operated only a few years past his death in 1979. He also had a regular column, Can this Marriage be Saved? In the Ladies Home Journal. During the dawn of couples therapy, “marriage counselors” like Popenoe instructed wives that their primary happiness in marriage was found in being a “helpmeet” and support to their husbands and children. The relative happiness and success of the marriage were her sole responsibility. “Marriage counselors” of the 1950’s also instructed wives to assist wherever possible in their husbands’ professional aspirations. 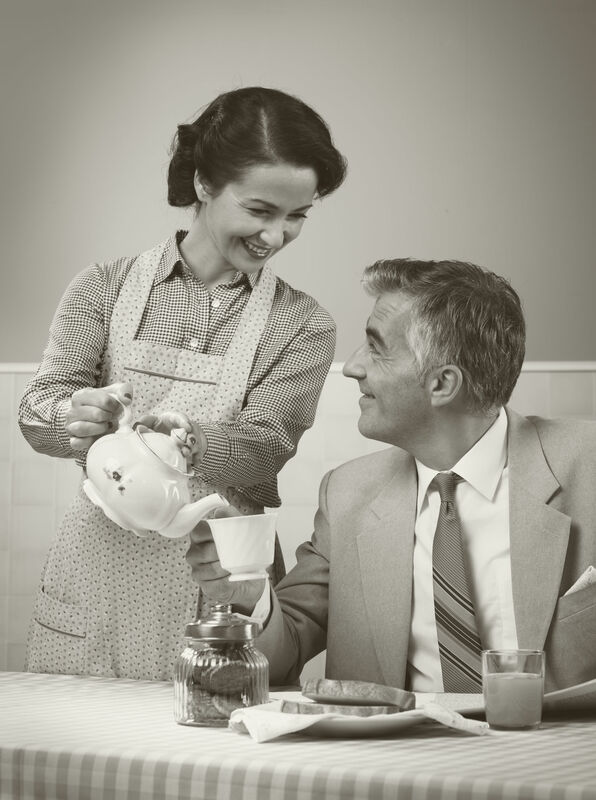 The corporate culture of the post-war era held that a wife could make or break her husband’s career. We employers realize how often the wrong wife can break the right man. This doesn’t mean that the wife is necessarily wrong for the man but that she is wrong for the job. On the other hand, more often than is realized the wife is the chief factor in the husband’s success in his career. –R.E Dumas Milner. Alcohol, domestic abuse, or chronic affairs. It didn’t matter. A man’s behavior was merely a “window” into the quality of his partner. If a husband was violent, abusive, alcoholic, or a chronic philanderer…well then, what was the wife doing or not doing to make him so unhappy? Before the advent of science-based couples therapy, “marriage counselors” like Popenoe instructed wives to reflect on how they eroded the quality of their husband’s marital experience. If a husband strayed, the wife’s job was to create conditions favorable for his return. If you fix your behavior… your husband might return. We have found in our experience, that when a husband leaves his home, he may be seeking refuge from an unpleasant environment. Could it be that your husband feels that he is not understood or appreciated in his own home? What might there be in your relations to him that could make him feel that way? Could you have stressed your contribution to your marriage in such a manner as to have belittled the part he has played and thus made him uncomfortable in his [own] presence? No problem in the dawn of couples therapy! Divorcees Anonymous (DA) was an organization that purported to “help” women avoid the shameful pitfall of divorce. It followed the cultural assumptions that the happiness of the husband should be the sole preoccupation of the wife. DA was essentially a form of peer pressure. The organization was founded by a male lawyer. Women would coach and provide help to distressed wives in troubled marriages by helping them to accept fuller responsibility for their husband’s discontent and take action to woo him back. This seems silly and ridiculous today, but such was the state of “expert” advice in the 1950’s. The “career” of being a wife began even before the wedding with attracting and securing a suitable husband. In the 1950s the prevailing cultural belief was that women benefitted more from marriage than men (science has now discovered that the exact opposite is true). Essentially women had to persuade and “sell” themselves as worthy spouses. It is up to you to earn the proposal — by waging a dignified, common-sense campaign designed to help him see for himself that matrimony rather than bachelorhood is the keystone of a full and happy life. The above quote is from the Ladies Home Journal four-part series in 1954 about the importance for women to engage in relentless self-improvement in the pursuit of a husband. In another one of the segments, a single 29-year-old woman wrote about a recent counseling session in a “Marriage Readiness Course” at Popenoe’s American Institute of Family Relations. Modern science confronts cultural bias and is curious and cautiously skeptical about how it informs the conversation. Thanks to Gottman and other researchers, we have learned that the actual truth of marriage and intimacy is sometimes counter-intuitive and can violate popularly held beliefs. The dawn of couples therapy was a dark time of ignorance, patriarchy, and unbearable pressure on women to accept full responsibility for the relative health of their marriages. Thanks to science-based couples therapy, we now know better. Can Science-Based Couples Therapy Improve your Marriage?